A smart, multi-band compressor that lets your true tone shine through. Powered by BOSS’s MDP technology, the CP-1X is a new type of multi-band compressor for guitar that preserves the character of your instrument and technique for unlimited musical expression. Intelligent processing analyzes your signal in multiple dimensions as you play, providing advanced dynamics control that never colors or muddies your tone like typical stompbox compressors can. The simple, four-knob interface makes it easy to dial in sophisticated results, while the handy gain reduction indicator always shows you how much compression is being applied. Optimized for all types of guitars, the CP-1X offers next-generation performance for every style of music. 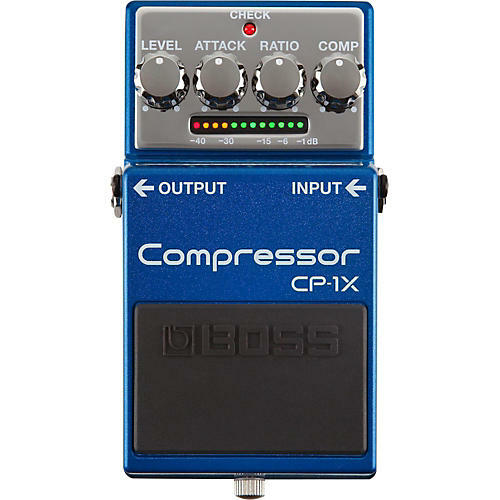 No matter what kind of guitar or style you play, the CP-1X always delivers rich, musical tone. From mellow phrases and arpeggios to heavy rhythms, fast solos, and beyond, every playing nuance remains detailed and defined. The pedal also provides superior performance for chicken pickin’ country licks, funky rhythm grooves, and other standard guitar compressor applications, and works great as a booster thanks to its punchy, transparent sound. On seven- and eight-string guitars, the CP-1X easily controls upper-range dynamics without compromising your powerful low-end tone. And when used with acoustic-electric guitar, the natural, lush overtones are fully preserved as you go from gentle fingerpicking to full-chord strums. With the knobs on most pedal compressors, what you see is what you get. Not so with the CP-1X, as the pedal’s controls interact with each other at a highly detailed level. When you turn a knob, numerous interlocked parameters are adjusted under the hood at once. This gives you dynamics control and tone shaping ability that far exceeds standard compressor pedals, providing results previously attainable only with high-end studio processing. The good news is that you don’t need to be a sound engineer to use the CP-1X—its sophisticated MDP processing has been meticulously fine-tuned by the BOSS engineers to let you dial in ultra-polished tone with familiar stompbox controls. The CP-1X features pro-level 18-volt input circuitry that provides ample headroom for the hottest guitar pickups, ensuring exceptional clarity with any instrument. A 16-segment gain reduction indicator clearly displays the compression amount, making it easy to see what the pedal’s doing. The CP-1X’s noise performance is also extremely low in comparison with other compressors, another huge benefit brought by BOSS technology. Leveraging decades of research and development, BOSS’s proprietary Multi-Dimensional Processing (MDP) technology offers a fresh approach to achieving exceptional guitar tones. In real time, MDP analyzes the various elements that make up the sound, including frequency, overtones, dynamics, pickup response, and more. Various playing characteristics are analyzed as well, such as note register, single notes vs. chords, bends, vibrato amount, and others. Each individual element is then processed in unique ways to produce optimized tones as you play. With its ultra-detailed, high-tech approach, MDP delivers tone quality and playability that reaches far beyond the limits of traditional effects processing.